There are certain signs which point to a movie being bad. The first is if “3D” is in the title. That means its either so-bad-it’s-good or it never should have been made. The second would be what the advertisements look like. To put it kindly, “Dredd 3D” looked on par with “Jonah Hex” when I first saw its trailer. Another mistaken adaptation for the 2000 AD comic. Fortunately, both of those signs were misleading. “Dredd 3D” is the real deal. One of the best action films of 2012. 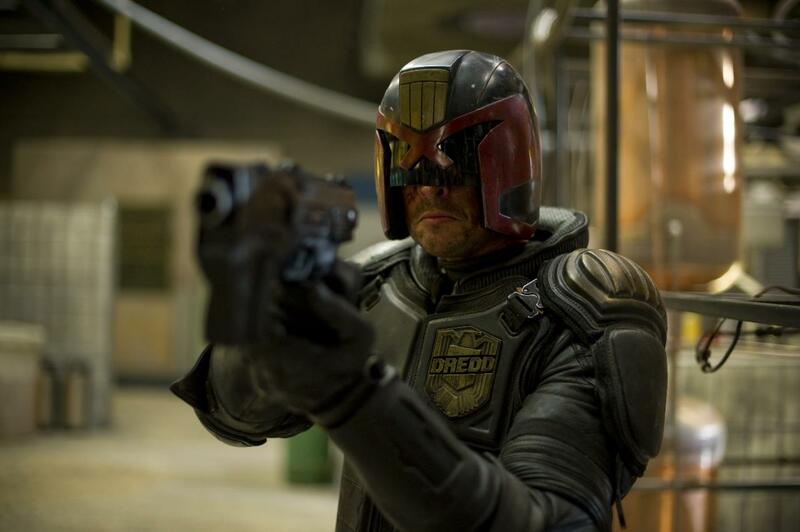 For those completely out of the loop, Judge Dredd (Karl Urban) is a futuristic mix between Dirty Harry and Robocop. He upholds justice to the letter of the law and isn’t afraid to execute criminals deserving of the punishment on the spot. The story here is a simple one. After being paired up with a rookie (Olivia Thirlby) who has psychic powers (remember, it’s a comic), Dredd responds to a homicide call at a 200-story housing complex. Upon arrival, the Judges find out the entire building is controlled by a single drug cartel. Worse, its leader, Ma-Ma (Lena Headey) shuts down the building and promises to kill anyone who helps Dredd escape. The Judge and the rookie he’s evaluating have to fight their way out and take down the cartel responsible for Mega City One’s newest street drug. Some people say that the plot was stolen from this year’s “The Raid: Redemption” but don’t let that be the reason you miss the film. In fact, this film was in development before “The Raid” and both are awesome flicks. So let’s not nitpick. Urban is a natural fit for Dredd, playing the character better than I had even expected back when he was announced for the role. He is a seriously underrated actor (and will probably stay that way since this movie is tanking at the box office). At first, I was a little worried the action would be underwhelming due to how tough the filmmakers were making Dredd out to be (what you might call “the Superman syndrome”). Over time, we get to see Dredd adapt to certain situations and the action gets more and more intense. This is a film full of tough-guy lines and bloody action scenes, so if that isn’t your cup of tea, you’ve been warned. For anyone who thinks that sounds like a good time, get ready to enjoy 2012’s most overlooked film. It’s about time someone did something interesting with the “found footage” genre. “End of Watch” follows the everyday encounters of Officers Brian Taylor (Jake Gyllenhaal) and Mike Zavala (Michael Pena) on the streets of LA. As he works toward a law degree, Taylor dabbles in a documentary filmmaking course. Through a series of small cameras, both Taylor and director David Ayer assemble a very intimate look of what it takes to be a cop in one of the most dangerous neighborhoods in America. There isn’t much of a plot to speak of in the film. Most of the scenes are just interactions between Taylor and Zavala during the daily routine of their jobs, which they are quite good at. This eventually leads them to being targeted by a drug cartel. All of this vaguely sounds like a plot, but “End of Watch” isn’t driven by a story. It is driven by the partnership of Taylor and Zavala, both on and off the streets. With the film’s dependence on its main two stars, it lives or dies by their performances. In this case, that’s a good thing, because Gyllenhaal and Pena are fantastic in this cop drama. They are able to pull off every aspect of their characters with full efficiency. The funny moments feel genuine, the tense scenes are direct and none of it feels over the top (as is often the case). Although “found footage” is a little cliche thanks to four “Paranormal Activity” outings and a handful of other horror films, “End of Watch” has a slight variation on the genre. Ayer’s film weaves back and forth between squad car cameras, handheld devices and other surveillance, but it isn’t limited to the protagonists’ cameras. There are even a few establishing shots throughout the film. Ayer sacrifices a little consistency in order to free his hands. If you can get over that, it does make for a better film. For 109 minutes, the film’s documentary approach leads the audience in a thorough examination of the life of a partnership. Weddings, funerals, shootouts and hospital visits. The thin blue line is well on display here and it’s rarely been done better. Some things should just stay dead. Through five installments, the “Resident Evil” video game-turned-movie franchise has been dividing audiences more and more. The original film in 2002 introduced us to Alice (Milla Jovovich), an employee with the Umbrella Corporation (responsible for making the T-virus, which reanimates corpses). Since the first film, Alice (who is not a character from the game series) has been fighting her former employers with advanced fighting skills, machine guns and, much to the loyal fans’ disappointment, super powers. At the end of “Resident Evil: Afterlife,” Alice and her friends are trapped by Umbrella. This film chronicles their escape from the corporation’s underwater facility. The fact that an entire 95-minute film is devoted to Alice’s escape is probably the film’s biggest fault, but more on that later. What we’ve come to expect from this franchise is simple (sometimes non-existent) storylines and in-your-face action. With that in mind, this film delivers, moreso with the former. There is action galore throughout “Retribution,” but there are a lot of little things to take you out of the moment. It could be the mediocre direction, the way Jill Valentine (Sienna Guillory) sways her body back and forth when firing two guns or a host of other things. The action is fun to watch but you can’t justify a $13 ticket on a half hour of slightly above average action scenes. In many ways, the film is just like a video game. Alice is the character a player would normally control, moving through different environments of the Umbrella facility. The film plays like the level of a game, complete with a map to let the viewer know the status of the mission. The difference between video games and film, however, is that dialogue, acting and storyline have to do more than just connect A to B. In “Resident Evil: Retribution,” most conversations only last as long as it takes to switch out a fresh clip and dozens of questions are left unanswered, skipped over in order to see the next stunt that Alice and her friends try to pull off. To let all biases be known, I actually enjoy this franchise. I played the original game, but I can understand some of the decisions made throughout this franchise to alter the console’s storyline. This franchise is the closest equivalent I have to people who watch “The Bachelor” or keep up with the Kardashians. I know it’s trash, but it’s still entertaining. Or at least it was until this film. At many points in this film I had to regroup in my mind and try to figure out how one character knows who another is, what this character over here’s motivation was and so forth. The script is completely nonsensical. If writer/director Paul W. S. Anderson (and I use the term “writer/director” loosely for the man who managed to make “Alien vs. Predator” uninteresting) gets his wish and one last installment is added to this franchise, I really hope he spends more time writing that script than it takes for me to review one of his films.